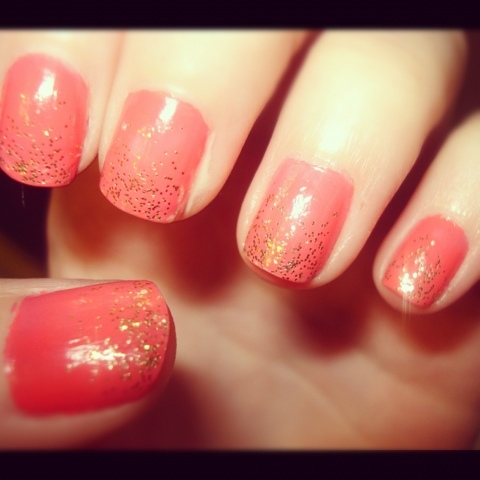 DIY Nails: Tips & Tutorials: When In Doubt, Add Some Sparkle! No matter how much you love your polish colours, they get boring after a while. The easiest way to dress up an old look is to add some sparkles to it! This is super easy, and really looks great! As you can see, here are pictures of ways I've done this. The gold sparkles are Nicole by O.P.I. 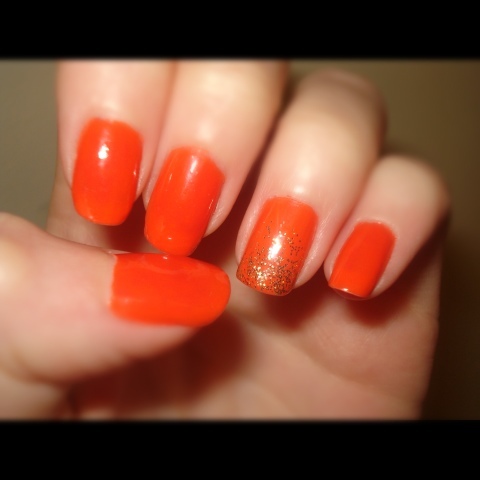 's "Twist of Fate" paired with Essie's "Cute as a Button" (pink) and Revlon's "Siren" (orange). When I add sparkles, I like to do a fade; heavy sparkle at the top, fading down to cover about 3/4 of the nail. The trick is to do layers of sparkles, so you don't put huge globs of polish on at once. I've used two layers in each picture, and it turned out really well. A look I LOVE is with the orange nails. A popular nail trend right now is to do something different on the ring finger nail to make it pop, and the extra sparkles added to it really takes this colour from great to gorgeous!